Preheat the oven to 350 °F (175 °C). Grease and flour muffin pan or use paper liners. Mix sugars, oil and eggs. Add pumpkin, milk and water. In separate bowl mix together the flour, baking soda, baking powder, spices and salt. Fill muffin cups 2/3 full with batter. Bake in preheated oven for 20-25 minutes. 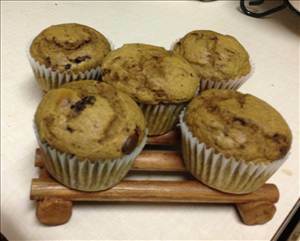 There are 206 calories in 1 serving of Pumpkin Chocolate Chip Muffins. Calorie break-down: 37% fat, 57% carbs, 6% protein.